Sometimes when you travel, you'd prefer to stay in an apartment than a hotel. Yes, you need to be in the city centre. But rather than constantly eating out, you might want to eat in - make your own morning coffee, have breakfast in bed, prepare your own meals in your own kitchen. You want a home away from home - without the awkwardness of being someone's house guest. That's where the aparthotel concept comes in. It's the best of both worlds. 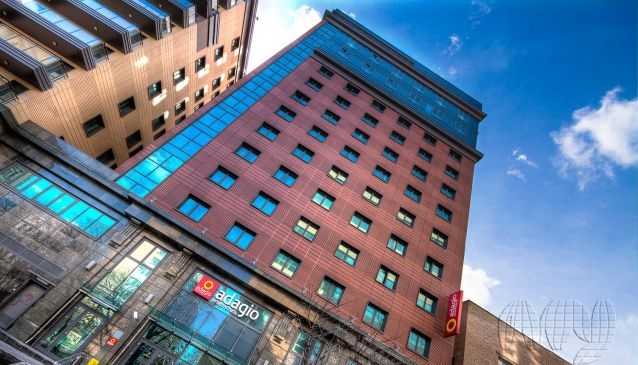 And now it's possible to have all that convenience in the centre of the Russian capital, with the recent opening of Adagio Moscow Paveletskaya. What's more, the per-night rate is lower the longer you stay. Besides its proximity to all kinds of transport, the location is highly suitable for business travellers as it's close to several major business centres where big-name multinationals and many other companies are based. There are numerous restaurants, cafes and bars in the area. World-class cultural entertainment is right nearby at the Moscow International House of Music. The Kremlin is only 2 km away and the Bolshoi Theatre - just over 3 km. Accommodation options range from studios with space for two people, to two-room apartments for four. There are 94 apartments in total, all with modern furnishings, fully equipped kitchens and other home-style conveniences such as an ironing board and iron. There's wi-fi, fitness and wellness centres, laundry and dry cleaning, wheelchair access and parking. And if you're in need of any additional services that Adagio doesn't provide, they're all at right at your doorstep at the affiliated Mercure and Ibis hotels. While Adagio is new in Moscow, it is already a well established brand internationally. It has many aparthotels in Europe - France, Belgium, Austria, Germany, Italy, Switzerland and the UK - as well as having a presence in Brazil and the United Arab Emirates.